The Dublin-based firm is reportedly seeking to set up in other Spanish cities. DUBLIN-BASED BURGER RESTAURANT chain Bunsen has opened its first international outlet in Barcelona. The chain, which previously featured in the Financial Times’ list of the fastest-growing firms in Europe, was founded by cousins Tom and Finn Gleeson in 2013. It operates four outlets in Dublin, as well as one each in Cork and Belfast, and is known for its minimal menu. The Gleesons also operate a Mexican food outlet in Ireland’s capital called Masa, which is run by Finn’s brother, Shane. 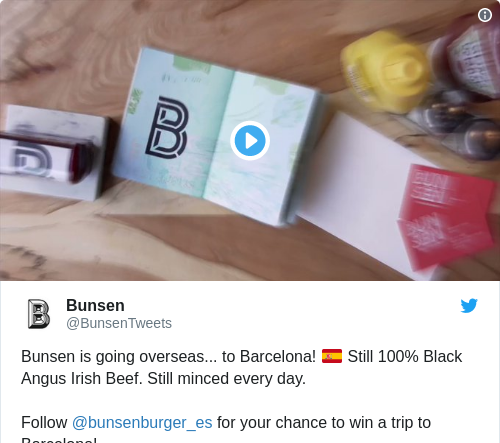 Bunsen quietly added Barcelona to a list of locations on its main website and has published a Spanish-language sister site. It has also set up a new Instagram and Twitter accounts. The restaurant is located at 46 Carrer de Ferran in a high-profile area of the Spanish city. Through an emailed statement, Tom Gleeson confirmed the opening to Fora. “We selected Spain because we always loved working with our Spanish staff in Dublin and some of them wanted to return home. Combined with the fact that Barcelona is a cool city and we thought Bunsen would fit well there,” he said. Bunsen is going overseas... to Barcelona! 🇪🇸 Still 100% Black Angus Irish Beef. Still minced every day. Further details of the restaurant’s opening appeared on Spanish business news website Alimarket, which this week reported that Bunsen was opening at a site previously occupied by a restaurant called Trobador in Barcelona’s Gothic quarter. Alimarket reported that Bunsen had been advised by the local wing of real estate consultancy Cushman & Wakefield, which it has reportedly tasked with finding more sites for the chain in Barcelona as well as potential locations in other cities throughout Spain. Bunsen’s founders have since 2016 had a Barcelona-based subsidiary called Kilrelig Restaurants, which lists Tom and Finn Gleeson as its “solitary administrators”, according to Spain’s database of company registrations. Bunsen generally does not disclose its financial information. According to the Financial Times’ 2018 list of Europe’s fastest growing companies, Bolus Restaurants, the company behind Bunsen, recorded sales of €5.2 million in 2016 and reported a compound annual growth rate of 143.8% from 2013 to 2016. The most recent set accounts for Bolus Restaurants Limited, which doesn’t list any employees, stated that it was sitting on a loss of just over €24,100 at the end of 2017. Bunsen’s six existing restaurants in Ireland employ 112 people. Correction: A previous version of this article stated that Tom and Finn Gleeson are brothers. They are cousins.